I spent the best part of my childhood falling down rabbit holes and uncovering fantastical alternate realities to escape into. Perhaps the Sagittarian streak in my birth charts was to blame for this, and much more. The world of myths and folklore had always fascinated me, and next to phoenixes and unicorns, centaurs were one of my favorite mythical creatures. 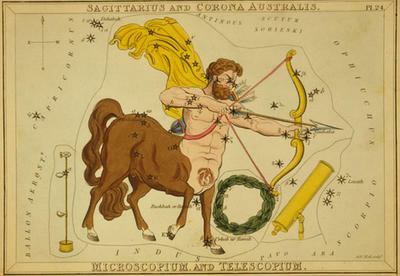 Not only was I strangely obsessed with fortune-telling and stargazing, the free-spirited impulse-driven centaurs, with their innate fondness for song and dance, embodied some of the very qualities I admired and sought to inculcate (leaving out the lascivious bits, of course). In a sense, the various positive qualities attributed to my zodiac sign not only credibly represent certain aspects of myself, but also point to the highest potential, my evolving personality strives to reach. For instance, while most Sagittarians are traditionally considered to be excitable, extroverted individuals, I’ve always identified myself, for the most part, an introvert (of course, college is trying to change all that). And while that resulted in occasional bouts of loneliness in crowded rooms, it did not deter me from approaching strangers and making friends in unexpected situations (and I’m grateful to my Sagittarian luck for that!). Maybe forging long-lasting alliances with one heart-felt conversation isn’t my cup of tea yet, but I’ve been blessed with a decent amiable personality that ensures encountering new people is always an enjoyable and enriching experience. But whether it is the expression of childlike innocence plastered on my perpetually-confused face, or something entirely different, that prompts others to instinctively trust me and shower me with thoughtful gifts, I’m never sure. Yet (and this is saying something), I can vouch for the fact, that for the most part, I’m a blatant and pathetically honest person. I expect openness and frankness in every single relationship, and a betrayal or an unmerited insult of any sort usually has me spiraling towards a depression. Even then, my trustworthiness has reaped other benefits: strangers have implicitly trusted me with their books, shopkeepers readily accede when I tell them I’ll pay them later for the items I purchased, and acquaintances have often shared their deepest secrets with me. And although, the brutal world has taught me (the hard way) that honesty isn’t always a good thing, the stubborn Peter Pan in me refuses to grow up, rendering me tactless in some situations. And that’s just one of the negative traits of an otherwise playful and childlike personality. Like a classic Sagittarian, I act before I speak, follow my heart to disastrous results, and swear loyalty to all things unconventional, much to the distaste of my conformist friends. I can be impulsive to a ridiculous extreme, seemingly inconsiderate and selfish as a consequence of my frequent daydreaming and my general oblivious attitude to whatever going on in the present moment, recklessly ambitious yet hopelessly careless, and at the same time, I’m one of those Samaritans who is personally offended by universal suffering. Perhaps the word I’m searching for is close to “over-sensitive,” yet I can make up for it by being occasionally (but hilariously) funny. On the other hand, I can be somewhat of a walking contradiction. Although I’m not that fond of the outdoors, I am consumed by a relentless passion for travel and one of the dearest wishes on my bucket list is a full-blown world tour. In one of the many fantastical realities I would conjure for myself as a child, I fancied myself as a wild-eyed gypsy, with a minstrel for a boyfriend, walking through dark forests by day, and reading Tarot Cards by night, inside a purple tent, perfumed with lavender incense. But backpacking all across Europe wasn’t much of an option, and my childhood sojourns were limited to visits at the local seaside, sometimes the hill stations, and rarely ever the urban metropolis. The seemingly endless stash of travel magazines (including vintage Nat Geo issues), postcards from pen friends of picturesque cities and illustrated encyclopedias fostered that insane desperate longing, to a greater extent. When it comes to eating habits, I’m all for appearances-eating like a horse at an exotic buffet and nibbling like a sparrow at vegetable soup-all the whole oblivious of the effects on my health. Which just goes on to show that Sagittarians tend to be tempted by all the good things in life, and actively encourage the pursuit of luxury and extravagance. There is also a Utopian sense of idealism that colors our very outlook on life. We romanticize our love lives much to the annoyance of realistic lovers, emulate via role-play the ideals we cherish, and celebrate every miracle because miracles are the best proof of our theory that the world is ultimately a beautiful place, as much wonderful and magical as our childhood Wonderlands. We are, at the end of the day, die-hard optimists. Maybe that is why Sagittarians are known to be eccentric in their behavior and fearless in love. No matter what life throws at us, we preserve the integral facets of our unusual personalities, and believe in a better, brighter tomorrow. In another sense, we believe it is perfectly okay to be ourselves, and we encourage others to do the same. Meanwhile being extremely playful and adventurous, I gravitate towards creative endeavors and artistic or literary pursuits. Work is drudgery unless there is plenty of “hammock-time “and play involved. I strive not only for creativity in the work space, but also in everyday life-be it tastefully garnishing a well-cooked dish, dressing with a touch of quirky, arranging objects in different meaningful patterns while dusting, flower-arranging, and the like. I have an evolving sense of what constitutes “my kind of beautiful” which is a mixture of imagination, nostalgia and fairy tales with “happy endings” (maybe that’s why I discovered Quail Bell!). And perhaps it is this happy-endings-always kind of optimism that ultimately sets us apart. We not only dream of a world of goodness but actively and steadfastly believe in it, and strive towards it.